Two things I truly love about Korea: Samsung and Melona. Don’t get me wrong. It’s not that I hate the country (or the people); it’s just that the culture boggles me. Take the novelty songs, for instance. While the cringe-worthy tunes and dance steps couldn’t exactly outclass the ones invented by Joey de Leon, at least with Itaktak Mo I can understand all the words. Which brings me to the hard-to-spell (and pronounce) words! Yes, I think there are too much k’s and g’s going on. 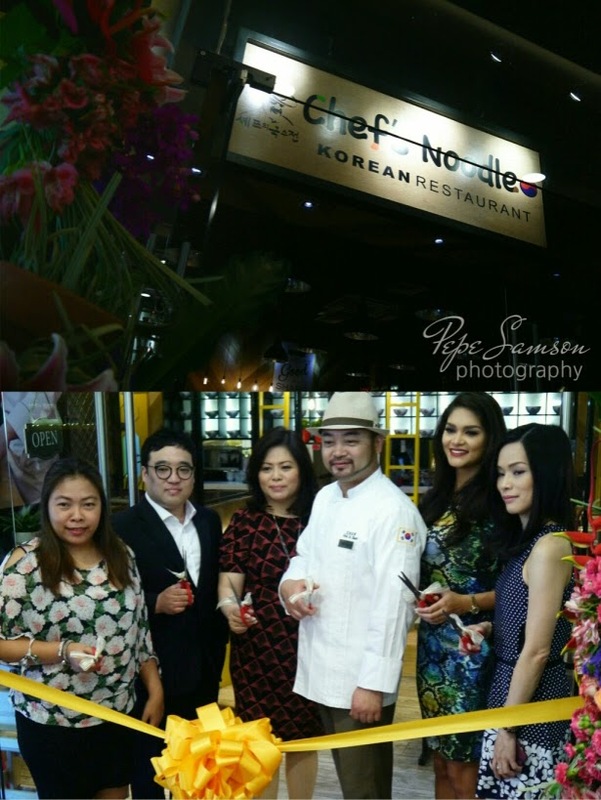 So when I got invited to the grand launch of Chef’s Noodle Korean Restaurant in Robinson’s Magnolia, a huge wave of panic washed over me. OMG, Kimchi! 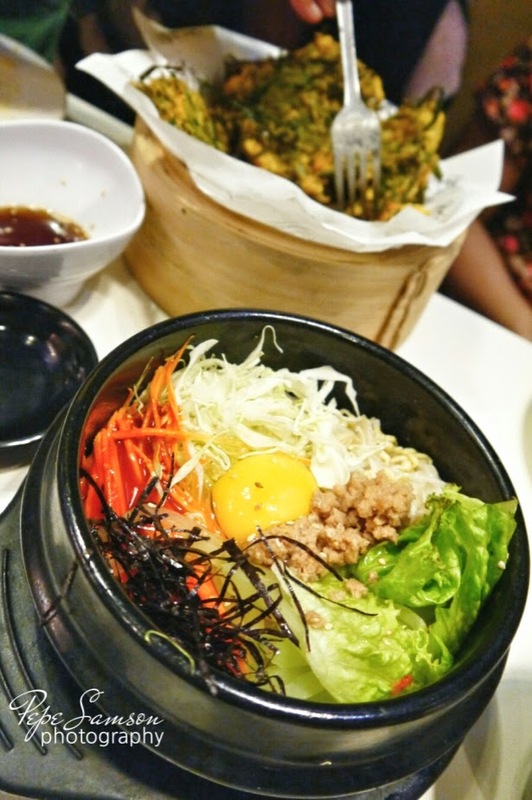 OMG, Bibimbap! OMG, kkkkggggggg-bap! What am I going to do??! After much careful thought, the idea that a free lunch could allow me to purchase a few more Melona bars won me over. Haha! Just kidding. 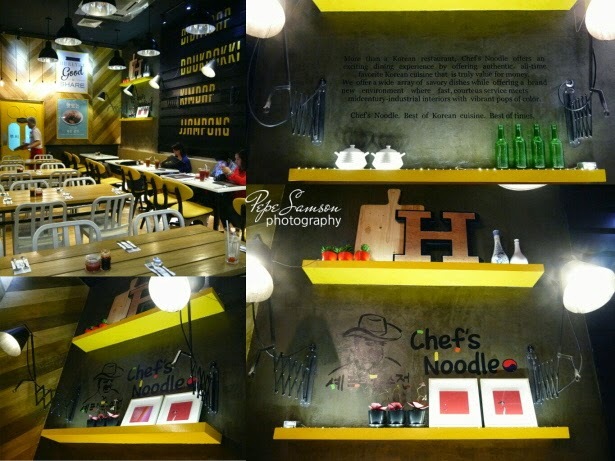 Chef’s Noodle officially opened to the public last April 23 in Robinson’s Magnolia—one of the newest additions to New Manila’s foodie scene. 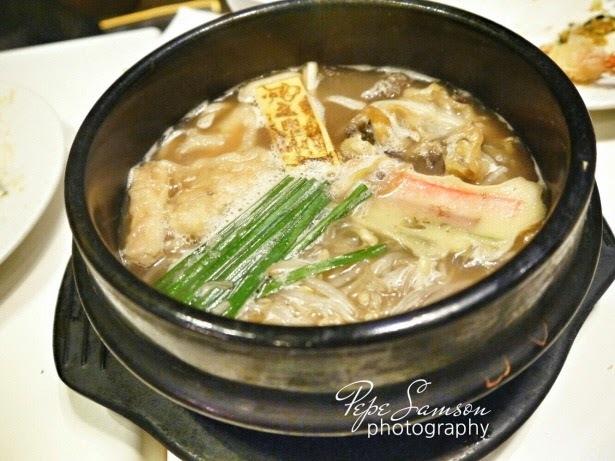 Situated in the ground level (beside the appliance store), Chef’s Noodle dishes out Korean fusion cuisine: traditional Korean food mixed with some playful reinventions. The launch and ribbon-cutting event was led by no less than the Korean celebrity chef (The Starking Show) Choi In Sun, who also developed the menu for this casual-dining restaurant. Along with him are Chef’s Noodle’s owner Mr. Kim Suk Hoon; Chef’s Noodle Philippines CEO Mary Simisim; Operations Manager Nancy Go; and celebrity endorser Pia Wurtzbach (where were Shamcey Supsup and Sam Concepcion?!). A short blessing ceremony was carried out to formally open Chef’s Noodle, followed by a coins-and-candies custom, believed to bring in luck. 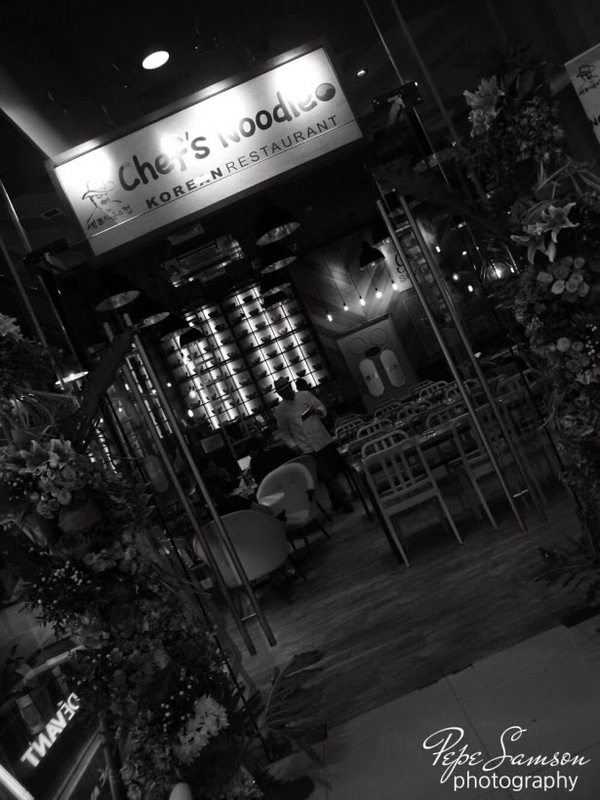 After meeting the people behind the acquisition of Chef’s Noodle to Manila, we were led inside the restaurant. The interiors were thankfully unlike any other Korean restaurants I’ve been to. No huge stars and huge screens playing K-Pop; in fact, the decors and set-up looked like something you might see in a campus café—relaxing, casual, accessible. Shortly after, the servers came and handed out menus. I was surprised that they let us order anything we want (instead of choosing which dishes we should try), so to simply our selection, I and my fellow bloggers decided to choose one of everything order a variety to share. 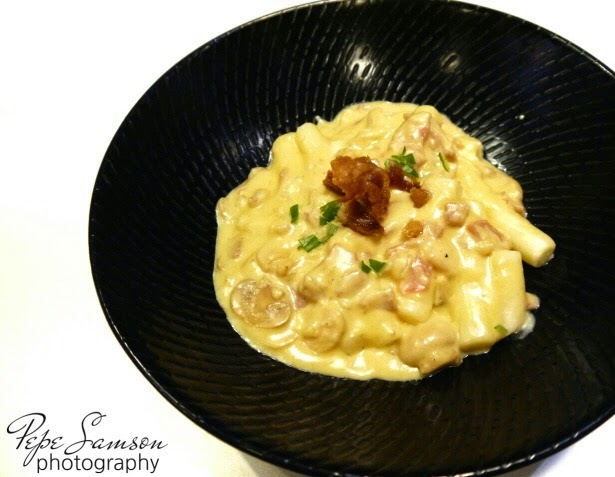 We started with the Ddukbokki Carbonara (see what I mean about their excess of letter k’s): a creamy pasta dish of peppered mushroom sauce topped with diced ham. I started dumping forkfuls into my mouth until I realized … this wasn’t pasta at all! What I mistook for penne was actually tubes of Korean rice cake! Heavy and chewy, the rice cake added a different, interesting dimension to the dish. So this was what they meant by Korean fusion huh? So far, so good. 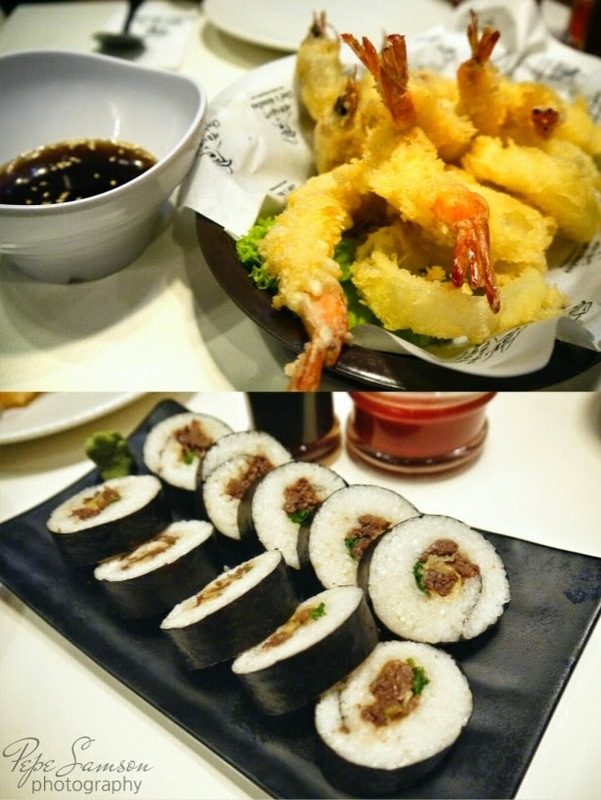 Next to arrive was the Shrimp Twigim—Chef’s Noodle version of the Japanese tempura. Although exquisitely light and perfect with the accompanying sauce, shrimps in batter do not necessarily excite me, so I took one piece of this and moved on to the next dish. The Bulgogi Kimbap is essentially bulgogi with sticky rice, then wrapped in a seaweed sheet. A bit bland when eaten alone—fortunately, the slightly spicy, special Korean soy sauce gave it some flavor. Two weird-tasting dishes arrived next: two that received a not-too-warm welcome from our table. The first one, the Leek and Shrimp Twigim—leeks and shrimps in a tempura batter, with hints of curry. 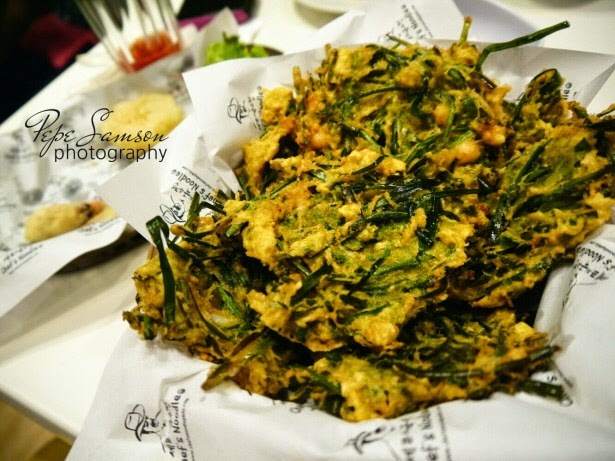 The other one was the Seafood Pajun, which tasted like the Twigim, minus the batter and plus the pancake. Surprisingly, despite everyone else’s animosity towards these dishes, they were two of the appetizers I actually really liked (maybe it's because of the curry). I even found myself getting a second helping! The Bibimbap, the Korean dish I am most familiar with, fell short in terms of flavor. Topped with sautéed vegetables, meat, nori strips, and a raw egg, the rice bowl came out to be a bit bland and forgettable—the only thing I could distinguish was a slightly spicy taste. Of course, we couldn't leave without trying Chef’s Noodle’s signature dishes. 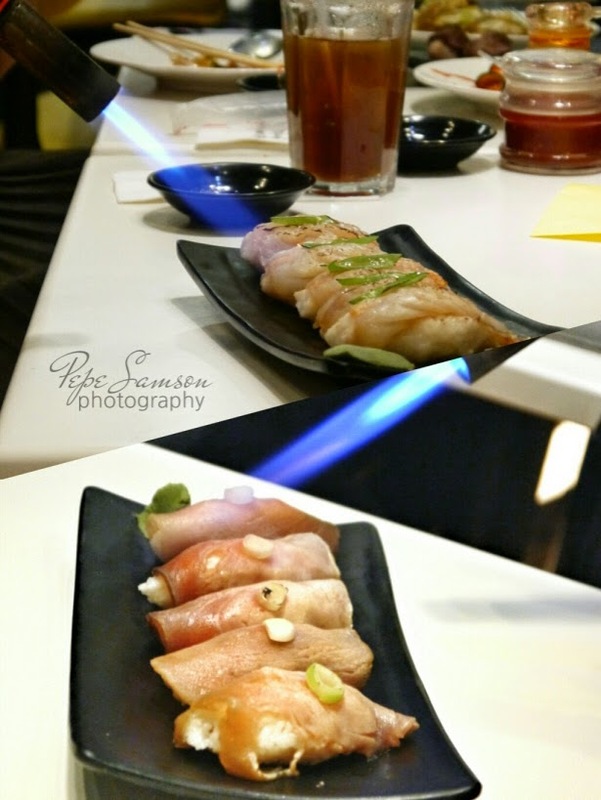 The restaurant features the Starking Fire Sushi, a dish developed by Chef Choi in his TV show. Like the Japanese sushi, it’s a sticky rice ball topped with your meat of choice: Australian beef, shrimp, or tuna. We ordered two variants: a beef sushi finished well-done, and a tuna sushi that was cooked rare. 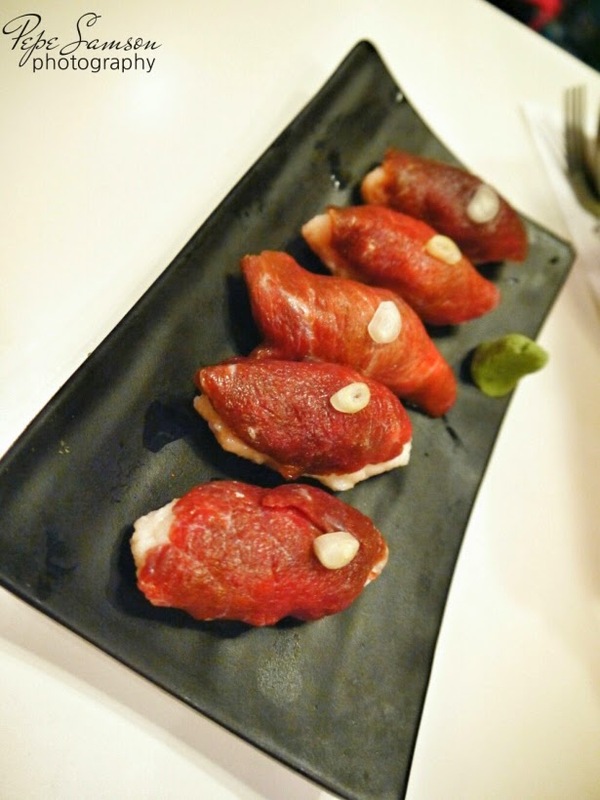 Thinly sliced Australian beef make up the Beef Starking Fire Sushi, P245/5 pcs. The actual tableside torching made the dish intriguing, but like the Bulgogi Kimbap, the flavors were a bit too subtle and required too much dousing with the special sauce. 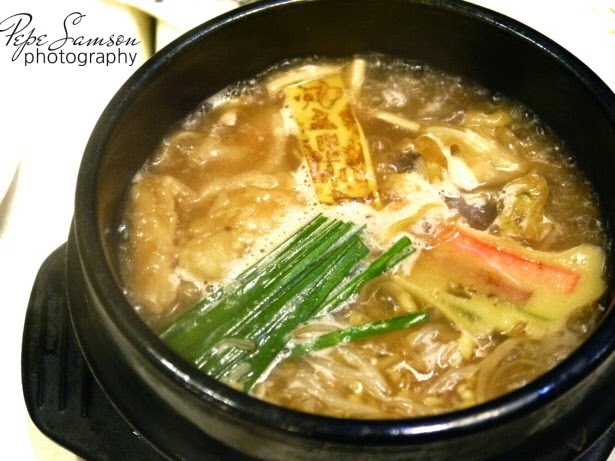 Chef’s Noodle, which the restaurant was named after, is composed of a beef broth base laden with leeks, bean sprouts, tofu, egg rolls, spring onions, and bulgogi. Admittedly, the broth was the star among the ingredients. I loved the spicy “follow-through”—you know, that lingering taste after you have swallowed it. This is one soup I could get addicted to! My only problem with this dish is that the noodles absorbed the broth when left untouched even for a few minutes, and all you’re left with are a big, soup-less bowl and soggy noodles. 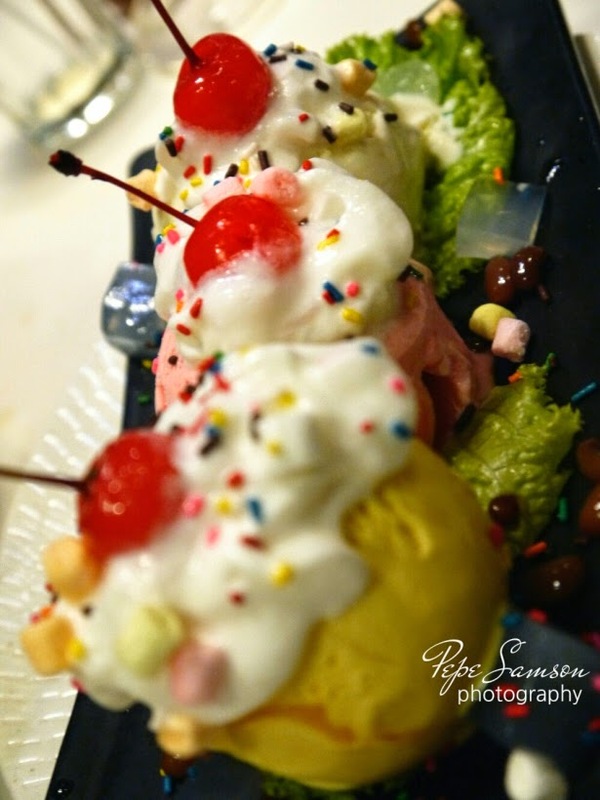 For dessert, our group shared a serving of the Stairway to Heaven—three scoops of ice cream topped with cherries and candy sprinkles. Not too original—except for the lettuce, LOL—and very lazily named—but hey, who doesn’t like ice cream? Despite some disappointing dishes (mostly, the sushi selections), I had a great time at Chef’s Noodle. The menu is extensive and to a certain point impressive, given that it plays with both traditional and modern. Not to mention that the dishes are reasonably priced—a normal diner would probably spend a hundred-fifty on the average for a meal (no drink and dessert included) since the servings are good to share. 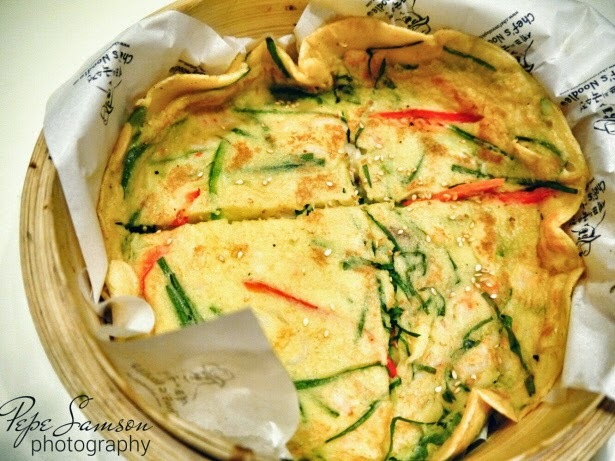 Fusing Korean cuisine with continental and other Asian cooking is probably too ambitious to carry out in a casual dining set-up, but Chef’s Noodle executes it very well. 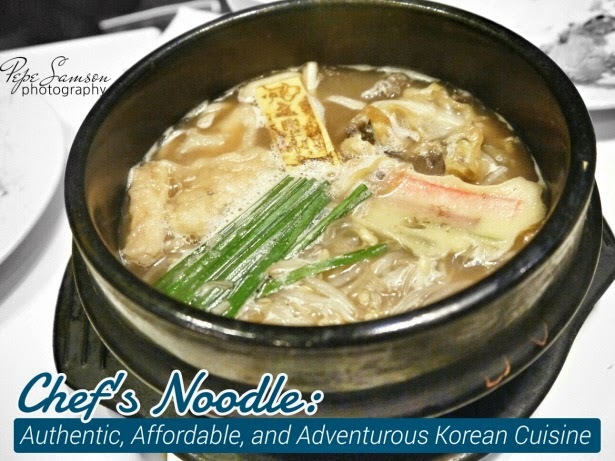 If you’re looking for healthy, affordable Korean food, head over to Robinson’s Magnolia and try Chef’s Noodle. Actually, scratch that. Make that, “if you’re looking for a gastronomic adventure”. Come to think of it, I never realized what word best describes Korean food until now. Adventurous. Yes. Now I understand their music with the abundance of k’s and g’s. Hit by the Korean craze? What do you think about Chef's Noodle? Leave a comment below! Haha! Dami mo kasing events. :p Thanks for dropping by! Err ganun po ba? Then about magkano po yung kimbap and dukkbokki nila? Thanks!